Knight Riders and Sunrisers suffered their third consecutive defeats while the visitors made their case stronger for the playoffs. The Men In Yellow kept their excellent run intact with yet another tense run chase. Opting to bowl first after winning his fifth consecutive toss, MS Dhoni was over the hosts in every way. Chris Lynn was the sole batsman who managed to settle down. His score of 81 constituted half of the runs that KKR managed to put on the board in the end. Tahir caused havoc with his four-wicket haul with one of them being the crucial important wicket of Russell, who departed for 10. The death overs proved to be the turning point as the visitors only managed to concede 19 runs off it. The chase began on a mixed note for the yellow army as Watson’s woes continued. Du Plessis, however, continued to flourish. 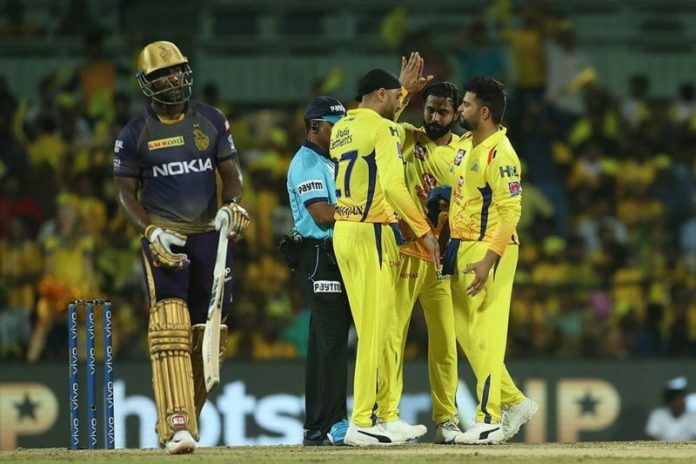 CSK had a wobble in the middle as Rayudu, Jadhav and Dhoni departing in quick fashion. Suresh Raina took the responsibility of taking the defending champions home with Ravindra Jadeja by side. To culminate the weekend action, SRH hosted DC at the Rajiv Gandhi International Stadium. Kane Williamson returned to action and took over the captaincy reigns from Bhuvneshwar Kumar. The 2016 IPL finalists opted to keep Mohammad Nabi off the squad as Khaleel Ahmed, Abhishek Sharma and Ricky Bhui paving their way in. On a sluggish pitch, the openers failed for the Chargers. Colin Munro, who came in at No.3 played a significant knock of 40 while handy contributions Shreyas Iyer and Rishabh Pant propelled DC to a competitive 155-7. The SRH openers found their rhythm during the chase after a couple of failures. Despite the start, the batting unit collapsed courtesy of brilliant bowling by the Chargers. The situation was so dire that barring the openers, no player managed to get to double digits. The fast bowling unit impressed by picking up all the wickets which resulted in yet another home defeat for the Sunrisers Hyderabad.